During the cover-up over Nibiru, the establishment has struggled to deny that Nibiru exists (they ignore all the photo and SOHO proof), deny that the predicted 7 of 10 plate movements have occurred, ignore the daily Earth wobble (they have no comment), deny that earthquakes and volcanic activity have been on the increase (they claim better reporting equipment is responsible for the uptick), deny that Electro-Magnetic Pulse is affecting mankind’s electronics (or blame it on the Sun), and assert that weather changes are due to man-made carbon emissions (Global Warming assertions). Where the 7 of 10 plate movements started by the end of 2010, as predicted by the Zetas, causing the Sunda Plate to drop, this was quickly covered-up in the press by claims that the flooding was due to rain, not loss of elevation. This despite MODIS satellite images showing otherwise, and despite reports from Indonesia that the sea water was pouring in. 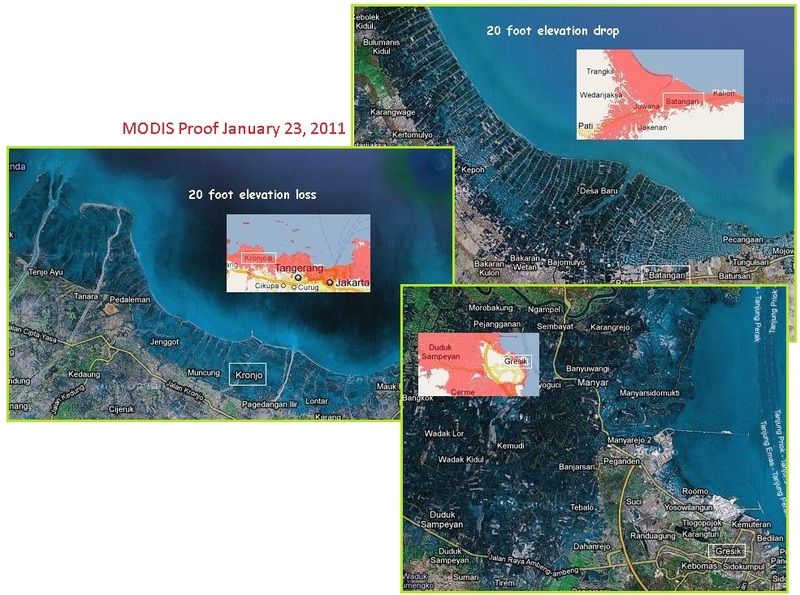 This determination to deny ZetaTalk accuracy reached the point where MODIS images were faked, the land view provided from older images while the weather cloud layer was current. Now in a modest attempt at honesty, the press is featuring the Banda Depression near New Guinea, a geological result of plate movements in the region. No explanation of why this happens, just that it does. It is a terrifying abyss, 7km deep. 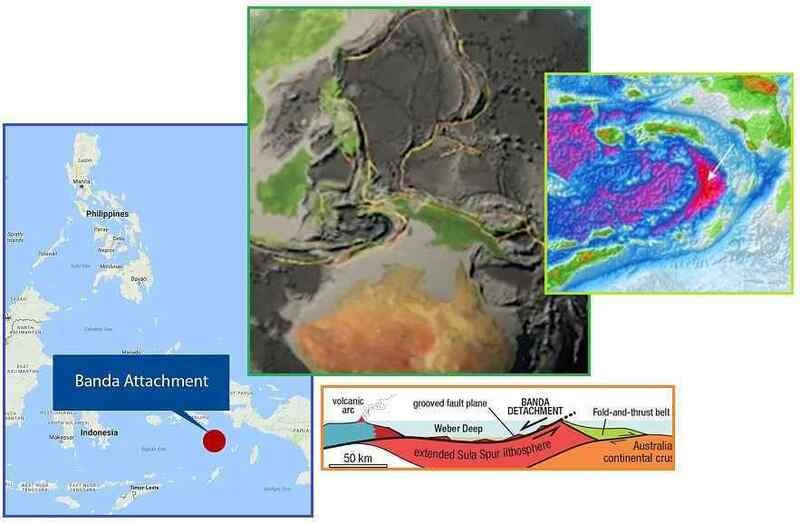 Now, geologists have for the first time seen and documented the Banda Detachment fault in eastern Indonesia - and worked out how it formed. The abyss has been known for 90 years but until now no one has been able to explain how it got so deep. A 7 km-deep abyss beneath the Banda Sea off eastern Indonesia was formed by extension along what might be Earth's largest-identified exposed fault plane. These wounds show that a piece of crust bigger than Belgium or Tasmania must have been ripped apart by 120 km of extension along a low-angle crack, or detachment fault, to form the present-day ocean-floor depression. This fault, the Banda Detachment, represents a rip in the ocean floor exposed over 60,000 square kilometres. ZetaTalk Explanation 12/3/2016: What caused the Banda Detachment abyss to form? As the Indo-Australian Plate tilts, its upper portion sliding under the Himalayas, it torques, Australia moving slightly and slowly to the North. In the curve formed at New Guinea, which is attached to Australia, also moves North, there is a void. Rock with an attachment to New Guinea clings, and there is nothing to fill the void. Why is this Daily Mail article posing the question, as though this is a mystery? They are attempting to incite curiosity in the public mind, and to show that for every rise in land, such as the great Himalayas, there is elsewhere an abyss. During plate movement, there are winners and losers, and the losers should beware! Electro-Magnetic Pulse (EMP) has been in the news since AF 447 went down over the Mid-Atlantic in 2009. The total electrical failure was blamed on bad weather and pilot incompetence. Since then there have been dramatic incidences such as MH 370 in 2014, which became a ghost plane during EMP but was claimed to be a plot by a deranged pilot. GermanWings followed in 2015 during an EMP that simultaneously caused CERN to falter, but was blamed on a suicidal pilot. 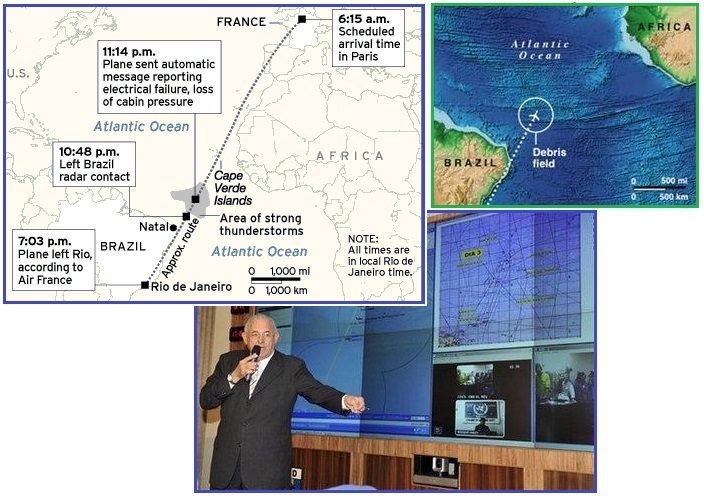 MS804 went down over the African Plate border in 2016, another electronic fly-by-wire plane, but this time the authorities delayed ascribing blame. Now, in an EMP incident over a plate border in Colombia, the press is admitting power failures were present as the cause of the crash. The Avro RJ85 plane, which was carrying nine crew, suffered power failures while flying through the Antioquia Department on its way from Bolivia. The pilot is believed to have circled around before crash landing in a desperate bid to lose fuel and avoid an explosion on impact. Just 20 days ago, the same plane had transported the Argentinian football team, including megastars Lionel Messi and Angel Di Maria, to Belo Horizonte in Brazil, where they played Brazil in a World Cup qualifier match. Team changed flights at the last minute to board the doomed British-made plane. 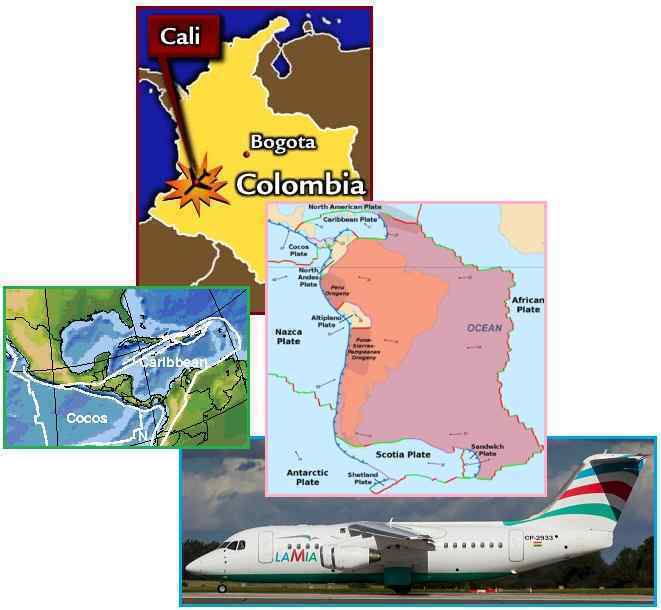 ZetaTalk Explanation 12/3/2016: The Avro RJ85 crashed due to electro-magnetic pulse (EMP), endured as it crossed over the plate border between the S American Plate and the North Andes Plate. Some assign the North Andes Plate to the S American Plate, and others assign it to the Caribbean Plate, as it has rock attachments to both. Though this region has not had heavy EMP before, the S American Roll is on the move, with an aggressive uptick. Pilots would be wise to avoid this plate border if possible, as it is subject to pressure from more than one source, and thus is likely to be under almost constant EMP in the future. Elon Musk has been in the news for his Mars endeavors. He is going to establish cities on Mars, colonize Mars, and this is all do-able. Just send your money to him, and he will make all this possible. Per the Zetas, Musk has been engaging in good old fashioned hucksterism - raising money for himself, while making promises. The thing that really matters is making a self-sustaining civilization on Mars as fast as possible. One path is we stay on earth forever and there will be some eventual extinction event. I don't have a doomsday prophesy. The other is to become a spacefaring and mutiplanetary species, which I think some would say is the right way to go - that's what we want. ZetaTalk Insight 10/1/2016: This is a money making endeavor by Elon Musk. The dates are all set out far enough into the future that he will not be challenged to deliver any but showy demonstrations on the Earth’s surface. Meanwhile, as the Earth changes progress, scaring the wealthy class, he will collect their funds. 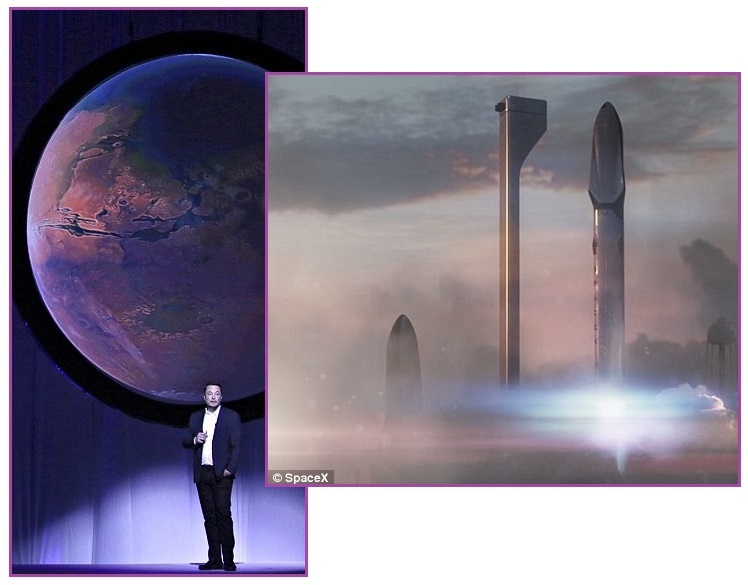 This will allow Musk and his cohorts to arrange a kingdom on Earth – secure, well stocked, and very high tech. This is hucksterism at its finest, a complete con job. He knows from the smackdowns that the Council of Worlds has given him that he cannot setup on Mars, the latest the dramatic explosions of the FaceBook satellite launch. 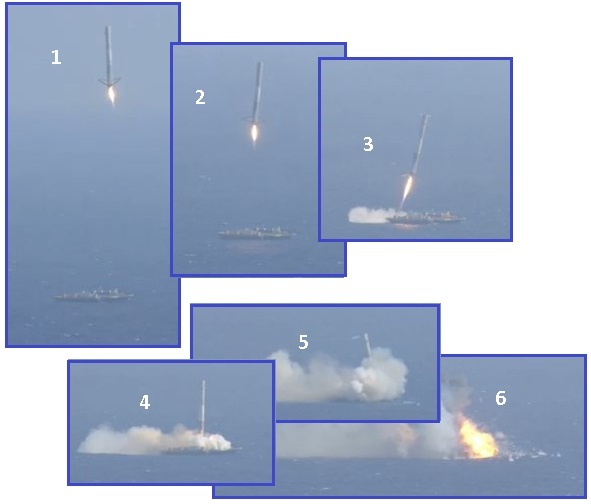 Elon Musk's endeavors have hardly been a success but rather peppered with failures such as the August 24, 2014 Space X explosion after launch and the April 15, 2015 crash landing on an ocean platform. Nevertheless, despite the many warnings the Council of Worlds delivers, Musk and even Obama chirp on about how achievable colonizing Mars will be. President Obama is setting his sights on Mars, writing in a new Op-Ed on CNN that the United States is partnering with private companies to send humans on an expedition to Mars and back by the 2030s. The president said the ultimate goal is to make it possible to one day remain on Mars for an extended period of time. "Getting to Mars will require continued cooperation between government and private innovators, and we're already well on our way. Within the next two years, private companies will for the first time send astronauts to the International Space Station. The next step is to reach beyond the bounds of Earth's orbit. I'm excited to announce that we are working with our commercial partners to build new habitats that can sustain and transport astronauts on long-duration missions in deep space. These missions will teach us how humans can live far from Earth - something we'll need for the long journey to Mars." Obama noted that more than 1,000 companies are already working on private space initiatives. ZetaTalk Comment 10/15/2016: The US cut NASA’s budget years ago, thus the need to use Russian shuttles to ferry astronauts and supplies back and forth from the International Space Station (ISS). 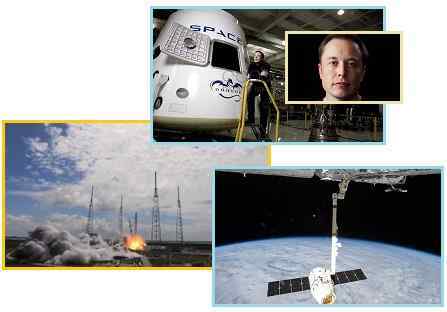 Private companies such as Musk’s Space X endeavors have been in the headlines. Obama’s responsibilities as a figurehead in making his Mars pledge were simply to remind the American public that NASA is an ongoing enterprise, funded, providing grants to private enterprise on occasion, and thus a partner in any success in going to Mars. Meanwhile, the Council of Worlds keeps making the point that man will not get to Mars. It is not just Elon Musk’s endeavors. The elite on Earth must ride out the Pole Shift with the common man. The ESA’s probe on Mars had lander problems. Twice. 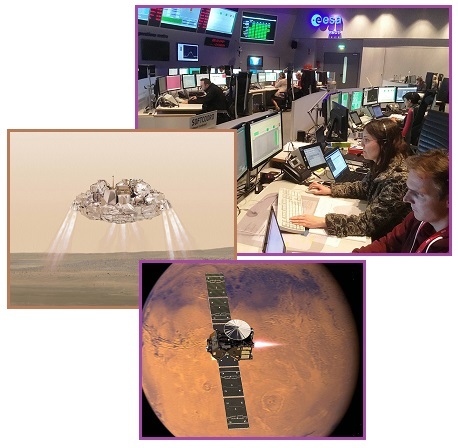 The European Space Agency’s (ESA) Schiaparelli probe has almost certainly crashed into Mars, making it two failed attempts from two from Europe’s space arm. It is believed that the lander deployed too early from the ExoMars craft, and then the parachute failed to jettison properly. ZetaTalk Comment 10/22/2016: Despite all the bragado by Musk about settling up colonies on Mars, the Council of Worlds is making the point, once again, that the elite will not be allowed to escape to Mars or the Moon but rather must endure the Pole Shift on Earth with the common man they so much distain. These elite have been responsible for the long-running cover-up over Nibiru, who is close by and about to make one of its famous passages, causing a devastating Pole Shift. 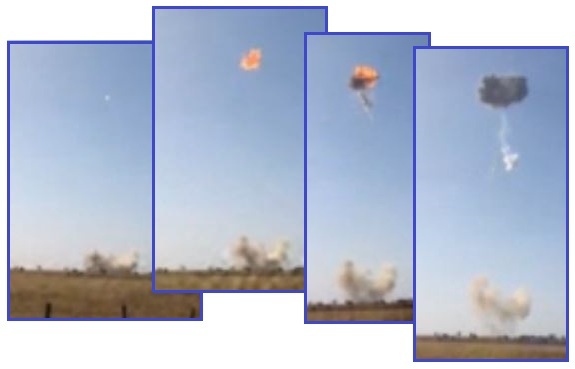 The media is admitting that the ESA had two failed attempts, back-to-back, and this last attempt had dual failures – early deployment and a failed parachute jettison. Got the message? Then there is the matter of the ISS, which is touted by Musk as part of his plan. He can use the ISS as some kind of launching station, or some similar outpost above the Earth. Yeah sure. The Council of Worlds has been sending increasingly urgent warnings about this too. Time for those poor astronauts and cosmonauts up there to come home before the trash in the tail of Nibiru turns the ISS into a death trap. The incident is the second time a Russian spacecraft has been lost in recent months. Last year, another Progress vehicle tumbled uncontrollably through space and failed to reach the station. In 2014, a rocket operated by a Dulles-based company now known as Orbital ATK blew up shortly after lifting from the launchpad at Wallops, Va. One of SpaceX's Falcon 9 rockets exploded a couple minutes into flight while headed to the station in 2015. 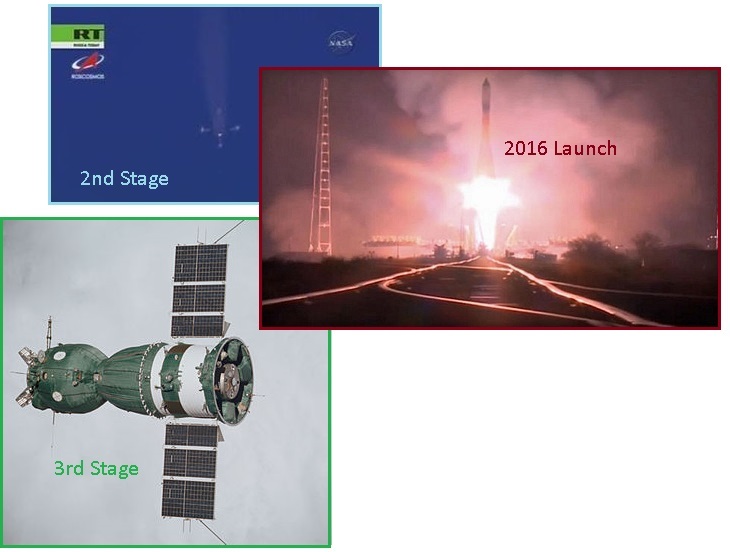 It was the third Progress failure in station history after third-stage mishaps in 2011 and 2015. The unpiloted Soyuz booster lifted off from the Baikonur Cosmodrome in Kazakhstan at 8:51 pm local time, climbing away through a cloudy sky directly into the plane of the International Space Station’s orbit. The initial phases of the flight appeared to go smoothly and the third stage engine ignited as planned to finish the boost to orbit. But six minutes and 22 seconds after launch - a little more than two minutes before the engine’s expected shutdown - telemetry from the vehicle was disrupted. The Soyuz launch vehicle is the most frequently used and reliable launch vehicle in the world. ZetaTalk Reiteration 12/3/2016: Is there a message in the fourth failure of a Progress re-supply mission to the ISS? As with Elon Musk’s Space X failures, which are mixed with success, the messages from the Council of Worlds is directed and obvious. We have referred to the ISS as a suicide mission, as the astronauts and cosmonauts assigned must surely know the risks. Debris in the tail of Nibiru is increasingly wafting the Earth, and even a minor impact can create a life-threatening crisis. They are in harm’s way. Why delay evacuating the ISS? It would be an admission of defeat by arrogant man, just at a time when elite such as Elon Musk are claiming they are going to populate Mars. The pace of ISS disasters is likely to increase now, to force an emergency evacuation. So now we have the ESA Mars lander, Elon Musk’s Space X launch failures (the most recent and dramatic the failure to launch the FaceBook satellite), and now the failure of the Russian Progress shuttle in its mission to resupply the ISS. Any other failures to Musk’s Mars lust of note? Oh yes, poor Buzz Aldrin had to be evacuated from the S Pole. Why was this 86 year old man down there? Per the Zetas, to promote Musk’s Mars lust. He is currently has fluid in his lungs but is responding well to antibiotics and being kept in overnight for observation. Aldrin, 86, is in stable condition after "his condition deteriorated" while visiting Antarctica, according to White Desert, which organizes luxury tourism trips to the icy continent. ZetaTalk Opinion 12/3/2016: Why was Buzz Aldrin so intent on getting to the S Pole, in a group of tourists seemingly so intent on getting to Mars? 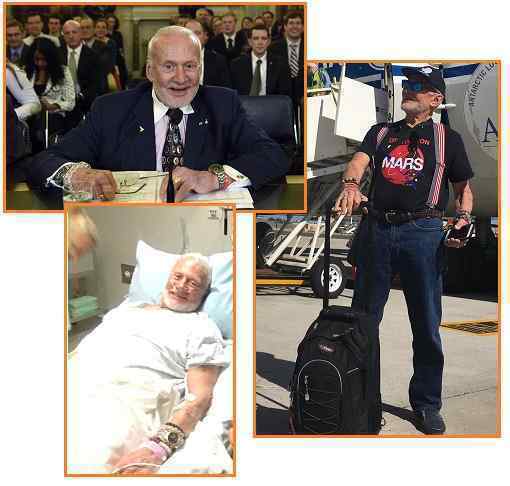 Of course he could be considered to be enthusiastic about travel to Mars, just as he was about travel to the Moon, being by nature a buoyant and enthusiastic person. To say the trip is ill advised for someone at 86 years of age is an understatement. The trip was being pushed by Elon Musk and other Mars opportunists, who are looking for a massive infusion of funds to their endeavors. As we have recently stated, these funds will not be used for the Mars endeavors, as Musk is aware the Council will stop him. These funds are to fund his kingdom on Earth. What is causing a massive asthma outbreak in Melbourne, Australia? Something new seems afoot, as 4 in 10 people recently so afflicted during a dust storm have never had asthma before. Historically, an episode such as this was unprecedented. Per the Zetas, this was due to Nibiru tail dust particulates, and this will only get worse as the passage approaches, particularly for the Southern Hemisphere. There were at least 8500 people treated due to the thunderstorm, many experiencing breathing problems. Four in 10 people experiencing thunderstorm asthma symptoms had not been diagnosed with asthma. A very unusual weather occurrence, thunderstorm asthma is triggered by large storms that can cause significant breathing problems even for totally healthy people. The big issue last time around was that the torrential rain combined with a high pollen count, sending millions of small particles across the city. The previous episode in Melbourne occurred on Nov. 25, 2010, but it was not nearly as severe. An earlier episode, in November 1989, sent 277 people to hospitals, and 47 were admitted. ZetaTalk Analysis 12/10/2016: Where dust storms can stir up pollen, they do not create pollen asthma in people who previously did not have asthma. The issue here is not the rain or pollen, but particulate in the vast tail of Nibiru which is wafting the Earth increasingly. Nibiru is slightly south of the Sun’s Ecliptic, and due to the Polar Push of the daily Earth wobble, Australia gets a lot of this tail waft. Normally, the dusty tail trash lands and lies on the ground where it can be collected during a dust storm. Will such storms continue? They will in fact increase, and may become common in the near future in other countries with a southern exposure too.